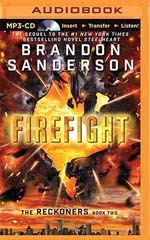 Brandon Sanderson, the #1 New York Times bestselling author of Words of Radiance, coauthor of Robert Jordan’s Wheel of Time series, and creator of the internationally bestselling Mistborn Trilogy, presents the second book in the Reckoners series: Firefight, the sequel to the #1 bestseller Steelheart.Newcago is free. They told David it was impossible, that even the Reckoners had never killed a High Epic. Yet Steelheart—invincible, immortal, unconquerable—is dead. And he died by David’s hand. Eliminating Steelheart was supposed to make life simpler. Instead, it only made David realize he has questions. Big ones. And no one in Newcago can give him answers. Babylon Restored, the city formerly known as the borough of Manhattan, has possibilities, though. Ruled by the mysterious High Epic Regalia, Babylon Restored is flooded and miserable, but David is sure it’s the path that will lead him to what he needs to find. Entering a city oppressed by a High Epic despot is risky, but David’s willing to take the gamble. Because killing Steelheart left a hole in David’s heart. A hole where his thirst for vengeance once lived. Somehow, he filled that hole with another Epic—Firefight. And now he will go on a quest darker and even more dangerous than the fight against Steelheart to find her, and to get his answers. I really liked Steelheart and this book was a good continuation of the story even though I didn’t like it quite as much. A new location, different situations, new epics, and even worse similes come together for a new adventure for David and The Reckoners. If you enjoyed the first book you will almost certainly like this one too…unless you throw the book through a window due to one of David’s many terrible similes. The story is kind of similar as Steelheart except that it takes place in the remnants of Manhattan where many strange things are happening. I had more trouble following the details of the world this time around because the descriptions of the world are a bit harder to imagine. The world as described is really interesting in concept but it’s hard to follow sometimes with how things actually play out. Sanderson is known for magic systems and he is no slouch here. The new powers and weaknesses of epics coupled with the the heck is going on with Calamity (the light in the sky that coincided with people attaining super powers) makes for interesting developments in the overall plot. I do like how Sanderson always has a plan for developing the magic system with each book and we definitely learn more in this book. I still really love the concept of a world with super heroes that are all corrupted – it’s such an interesting spin on the normal super hero story. On the audio side of things MacLeod Andrews does a fine job narrating the story. He does some good voices that fit the characters well and puts sufficient emotion in his delivery. I think the audio version of this book is a great way to experience it.